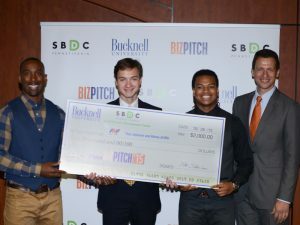 Bucknell University’s annual BizPitch Competition gives student entrepreneurs the opportunity to win prizes to help them launch their ventures. 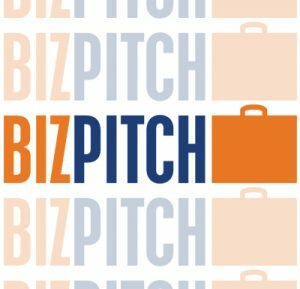 BizPitch was created by and is administered by Bucknell’s Small Business Development Center (SBDC). Competitors will connect with advisers, gain exposure in Bucknell’s entrepreneurship ecosystem, and can pursue membership in StartupLewisburg, Bucknell’s home and incubator for innovators and entrepreneurs in downtown Lewisburg. The Bucknell University BizPitch (Business Pitch) Competition is open to full-time students at Bucknell. Students may compete in teams (recommended) or solo. Students may be contributing members of multiple teams, but may only be a part of the pitch presentation for one entry. Teams may include non-Bucknell student members but presenters must be Bucknell students and must play a major role in the venture (co-founder or “C” level position). Entries may not have won a top 3 prize inprevious BizPitch Competitions, and firms that generated revenue prior to 2015 are ineligible. Pitches will be evaluated using the following criteria. Please note that a “teaser” video and social media efforts are optional, but are a great way to help your pitch — and your startup! (10 points) Innovation — is this a new idea with high potential for impact? (10 points) Clarity — is the presentation concise and organized? (10 points) Comprehensiveness — does the presenter demonstrate knowledge of the market and how the business will operate? (10 points) Feasibility — is this proposed venture realistic to implement? (5 points) “Wow” factor — judge’s discretionary points to award for above and beyond efforts, energy, and passion. Prizes will be issued to the firm if established, or to the individual identified as CEO if firm is pre-venture. Individuals receiving prizes must be Bucknell students. Prizes are subject to tax withholding. Please be prepared to provide the information below. Once your entry is submitted, you will be able to login and edit it until the deadline.